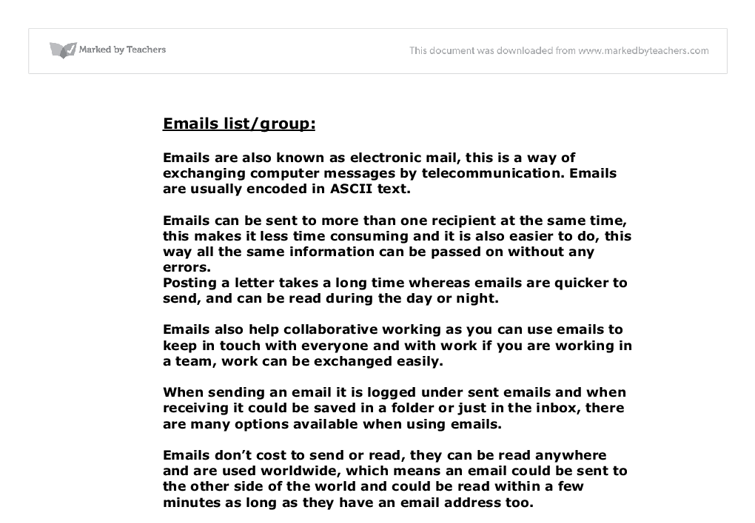 Emails list/group: Emails are also known as electronic mail, this is a way of exchanging computer messages by telecommunication. Emails are usually encoded in ASCII text. Emails can be sent to more than one recipient at the same time, this makes it less time consuming and it is also easier to do, this way all the same information can be passed on without any errors. Posting a letter takes a long time whereas emails are quicker to send, and can be read during the day or night. Emails also help collaborative working as you can use emails to keep in touch with everyone and with work if you are working in a team, work can be exchanged easily. When sending an email it is logged under sent emails and when receiving it could be saved in a folder or just in the inbox, there are many options available when using emails. Emails don't cost to send or read, they can be read anywhere and are used worldwide, which means an email could be sent to the other side of the world and could be read within a few minutes as long as they have an email address too. Forums Forums are like an online open discussion board really helpful for collaborative working as you can post your work and then another person could come along; provide suggestions on thoughts, opinions and improvements if needed. ...read more. On a blog you could use it as a discussion board, a daily diary or anything you want that could interact with other bloggers too. This is a blog, it is like a discussion board and anybody can join and put their views and comments across, so it's a discussion and anybody can participate in it. Content Management System A Content management system controls who can access it to view files and data and those who cannot access such data. A content management system could also get back lost data which might have been deleted by mistake or has been lost. On a CMS you can store videos, music, movies and many other large and various types of data. A CMS is like a group of people working collaboratively, you can either do the through the computer and then CMS your work or you can do it by hand and then share it so other people that might need to see it will be able to do so. Sharing and setting up diaries Setting up diaries is a very common way of staying up-to-date with work such as deadlines, targets when using a diary you are more likely to hand in the work in on time. Diaries are easy to use, when using a diary the work is also more organised. There are lots of different types of software that allow you to schedule your events or activities on. ...read more. Part C: I will be doing research on mobile phones but from the future. Keyword-Future of mobile phones The keywords have been recognised but it wasn't what I expected, so this shows my results came up according to what I typed in the search bar. Advanced search technique This is an advanced search that I carried out These are the results I got for "future of mobile phones", this matches my search exactly and it's what I would have expected. Wildcards: "futu?e of mob*ile phones'" On this search I have carried out, I got 2 searches according to mobile phones and the other searches are not relevant to what I am looking for. Boolean operators- And search Future of mobile and phones, this is the AND search I carried out I got and I got these results: I got some relevant searches and some of them were not relevant to what I thought I would get, so according to me the results were poor. Web crawler (Google) searching through keywords: I have entered this in the Google search engine and the results that I got were: These are the results I got for my search and they are relevant to my search, I am happy with the results. I got this search result, which is a lot in 0.17 seconds Now when I type in Google, "future of new mobile phone technology" For the search results theirs about 43,800,000 results show up, but when I typed in a single keyword and made the search simpler more results showed up. ...read more. This level of knowledge should be enough to enable them to be taught how to operate the data input forms and reports. I will leave the decision of staff training in the usage of ICT systems up to the manager, though I suspect that it would be sufficient for him to teach them himself. After having tested the website in four different Internet browsers (Microsoft Internet Explorer, Mozilla Firefox, Google Chrome, and Apple Safari) I have found out that all its features work perfectly on all four of these without the need of any add-on. The first method that I will use will be the form of an interview with the two managing directors of EVDOP Live- Kerry Lindop & Peter Evans. Interviewing the clients of the company who have asked for my solution will have various benefits. I test these different processes for any anomalies, as problems could occur such as loss of information or nothing being sent, this could be due to problems with my PHP code, meaning that our form's do nothing on the website and are pointless. 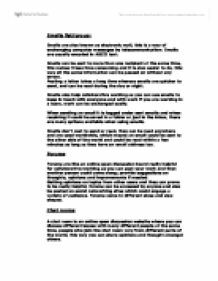 Images can be found on the internet for use in presentations also research notes to inform other students what they have found e.g. if the teacher asks for presentations on different types of drugs then each student can select a drug and give an informative presentation about it. 258 million letters handled by the Royal Mail in the same period." - The Guardian Newspaper Instant Messaging An instant messaging service on the internet is defined as a type of communication service to create an online chat room with another individual, who is in your private list.